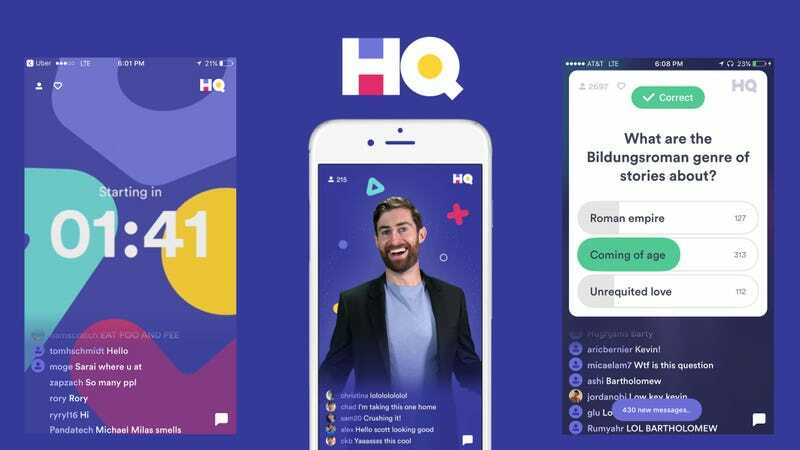 HQ trivia is so popular that it regularly fails to broadcast its online game show at the proper time. Since its recent launch, users constantly beg their social media followers to use a referral code when they join. If someone you know punches in the code, you get an extra life. But it turns out there’s a much easier way. The way the game works is simple, you log on at 3 PM or 9 PM EST, a live host appears onscreen and asks 12 trivia questions. You have ten seconds to answer each question, and if you get it wrong, you’re out. If you get it all 12 right, you get to split the jackpot with the other winners. The amount of money changes every day, and it rolls over if there’s no winner. It can be a brutal process. Especially if you wait around while it works out technical difficulties, there’s a lot of buildup just to get booted on the second question. But if you have an extra life, you get to jump back in and keep playing. Mashable points out that there’s a little secret that can help you get an extra life without having to spam your friends with a referral code. Just open the app, use two fingers, and swipe up rapidly over and over again. If you do it right, the little heart at the bottom of the screen should go from being empty to displaying a one. Or, you know, if you already have extra lives, the number will go up. The Gizmodo team tried it out, and it works for us. Admittedly, it takes a little maneuvering because you can accidentally hit one of the buttons on the interface. I found it’s easiest to just flip the phone upside down and swipe down with two fingers really quickly. Mashable notes that you should keep in mind that “you can’t win off an extra life. And you can only use one extra life per game.” That wording is kind of confusing, and HQ has used the same wording on its Twitter. It makes it sound like you can’t win if you use an extra life. That would pretty much make extra lives worthless. But it seems that all they’re saying is that you can’t win automatically if you get the last question wrong and just trigger your extra life. We’ve asked HQ for clarification, just in case. We’ll update this post when we receive a reply.